Sometimes there are things in your past that you wish could be remained buried forever. And those are the things that have a tendency of creeping up on you when you least expect it. This i s what happened to my best friend, Micah one day. You see, it all started one morning when Mark and I were out riding our horses. Suddenly, on the road ahead, we saw a saddled horse grazing. “It looks like somebody lost their horse or it lost them!” I commented to Mark. I told Mark to stay where he was while I went to investigate. The fact that I found blood on the saddle didn’t make me feel too good about the situation. I didn’t see anybody, so I called out, “Anybody here?" A man groaning was my answer. So I hurried up to the bushes and saw a man who had been shot and was bleeding heavily. I assured him I would get him to a doctor. “North Fork…Going to North Fork!” He stated. I called for Mark to come help me. I’m sure I looked a sight as I rode into town with what appeared to be a dead straddling in front of my saddle. But without a buckboard, I had little chance of an alternative way to get him there fast. While I sent Mark for the marshal, I asked one of the men to help me get him down and into the office. Old man Hannabury was curious to know what was going on as usual. I went into Dr. Burrage’s office to help out. Old man Hannabury had already walked inside. I was busy getting some Brandy for the doc and doc was busy working. No one had time to listen to this old man. Doc asked Hannabury to leave, but he didn’t want to. Hannabury suddenly looked at me and I simply pointed at the door. This made him want to scoot right out…there’s something about me that makes people listen without my ever saying a word! Doc asked me to look through the man’s pockets to try to find some papers. He would need next of ken. “Is it that bad, Doc?” I asked. “Probably worse,” Doc answered me. “He’s had that bullet in him for a day or maybe two…” he commented as he worked. Then I looked at the cards I found in his pocket. It was a marked deck. That could explain why he was shot all right! Micah came in then. He walked up to the man lying on the cot. Then an agitated expression suddenly came over his face and he muttered, "Stoddard!" The doc and I were both shocked at his words. “What did you say?” Doc asked him, not believing he actually heard what he thought he heard. Micah said it louder this time so there was no mistake. “I said let him die!” Then he walked out. Naturally, I started to follow him. This wasn’t like Micah at all and I had to find out what was going on! But the doc stopped me and told me Stoddard needed a transfusion immediately. I was the only one who could help, so I started taking off my shirt. Micah hurried to his office, shut the door and locked it, and banged his fist on the desk. This man really made his blood boil! "Not if I have to stick people with needles!" he declared. He didn’t like being stuck, and he didn’t like me being stuck. Mark was always thinking of the practical. "But suppose they don't mix?" he asked worriedly. Unbeknownst to all of us, there were some men looking for this man. They were on their way into North Fork. But I’ll get to that in a minute. First, I needed to go check on Micah. Like I said, Micah’s actions weren’t like him. I knew something was wrong and was going to try my best to find out. Leaving Doc’s office, I went straight to Micah’s. I told Mark to wait outside the doc’s office for me. I knew he didn’t need to see this! I was surprised to find Micah’s door locked. Turning, I asked Mr. Hannabury if Micah was in there. “Well, I reckon he is. I saw him go in there. I saw him draw the curtains. I didn’t see him come out. Micah asked how the patient was, and I stated we didn’t know. Doc was taking out the bullet. I poured a cup of coffee as Micah mumbled, “Bullet. That’s something ain’t it? "I'm gonna tell you a fact that you won't believe Lucasboy," said Micah. "I've worked 26 years out of my life as a peace officer and I never had as much faith in justice as I do right now." He pounded a fist on his desk angrily. "Not one day in 26 years has the whole pattern, the rhyme, the reason made as much sense as it has today." I broke into his hateful speech. "Who's Stoddard?" I asked calmly. "What's he to you Micah?" I asked in a voice that meant I expected an answer. "You wasted your blood Lucas and that's too bad." He stated. That didn’t sound like an answer to me! This made me angry. He was unwilling to explain his hateful, vengeful actions to me. "That was my decision!" “I’m just telling you he wasn’t worth it!” Micah stated, still avoiding my question. Then I saw the empty whisky glass on his desk. I could tell he had been drinking, and that made me mad. I couldn’t understand why he had to turn to drinking instead of dealing with his problems. “He's not worth getting drunk over either," I accused. "I think that's my decision!" Micah said rather hatefully to me. I didn’t appreciate my best friend shutting me out like this. I slammed the glass back down on the counter angrily, letting him know what I thought of his actions. “I’ll see you later!” I promised. I would come back and try again after I had calmed down. Going outside, I told mark we were going home. Mark wanted to stay in town to see how the stranger was, but we had things to do at home and there was nothing here for us to do. Suddenly, Mark said, "I don't want him to die Pa."
Maybe it was because I was angry. Perhaps I was angry at Micah for shutting me out and treating another human being in such a manner. Or perhaps I was angry at the man for whatever he did to upset Micah. Or maybe I was angry at Mark for caring so much. Whatever the reason, I stated, "You barely knew him.” I was wrong in stating it and Mark let me know as much. "That don't matter," said Mark. He was right. "No, it doesn't." But we didn’t get very far. You remember those guys I told you were on their way into town? Well, we suddenly met them on the road. The head of the group wanted to know if I was a resident of North Fork. I told him I was. The man then informed me that they were from Talbot city. It didn’t take long for me to find out what they wanted. They were a People’s Committee looking for Stoddard. “He’s in the doc’s office in town. But…uh…he won’t be going no where,” I announced. “Dead?” the man named Jethroe asked. I could tell he was hoping. "Almost," I answered. "Today's our lucky day," said Jethroe. “What’s a People’s Committee?” Mark wanted to know then. “Vigilantes. Some parts of the country don’t have much law. Some people have to take things into their own hands. Then I suggested we go back to town so I could try to keep the peace. The People’s Committee beat me back to town. They immediately went to harass Doc Burrage into giving up his patient. “Doctor, you have a wounded man inside named Stoddard. Is that correct?” Jethroe asked. Doctor Burrage didn’t even have to think about his answer. "It makes a difference to me! Good day gentlemen," said the Doc. Suddenly, one of the men blocked Doc’s way to get back inside. He demanded they let go of the door, but this man advised him to let go of Mr. Jethroe. I kept a stern look on my face the entire time I talked to him. He had an evil looking smile on his face, and I wanted to wipe that smirk right off! “We’ll talk about it, Mr. Jethroe!” I stated as I tried to walk by. But he stopped me with more words. “Well that’s fine. Now, we’re gonna rest and feed up. It’s been a long trip. But we’ll be back. In say an hour. You think about what I said, Mr. McCain. You’ll see I’m right. "We don't intend to leave North Fork without him.” Again I stared at him, and again he leered at me. I finally walked past him and into the doctor’s office. I wanted to know how he was. I reminded doc that they were a legal committee. Then I asked him what his chances were if he wasn’t moved. Doc got upset and stated, “ I don't think that's the point, do you?" I didn’t. I then walked over to Micah’s office to see if he would help. I had my doubts, but it was worth a shot. He told me that they were a legal committee and although we may not agree with the laws of Talbot City, we had to respect them. I told him that the Doc said if Stoddard was moved he would die and he may die anyway. "The quicker the better," said Micah. I shot my head around at him. He was still on this vengeance kick. That just wasn’t like Micah. "Since when did we become judges?" I accused him again. Micah was angry and bitter. I could see it in his eyes and hear it in his voice as he walked over to me. "I've never judged anyone in my life Lucas! I've walked out in that street and hundreds like it for the scum of the earth and never did I complain! Well I'm complaining now! I'm telling you Stoddard isn't worth it! I know!" I didn’t know this man, but I knew he was a dying man and deserved our protection as much as any other dying man did. “Suppose he isn’t,” I stated, not sure rather he was or wasn’t at this point. It wasn’t my place to judge anyways. But I knew one thing and I told Micah. “You let those Vigilantes take him and it’s another word for murder!” What’s got into you?” I was worried about him. Worried what he would do. Worried at what had gotten him this way. "I'm just like any other human being full of love, greed or hate!” Micah yelled. Then he got angry again. “And by hate I mean hate." I stayed quiet and let him blow off steam. Maybe it would help him. Maybe he’d tell me what was going on. But instead, he was being hateful to me, his best friend. He was making fun of my love for human beings. “Oh, I’m not like you. Lucas McCain, the honest protector of our morality!" He mocked me. “You know, we oughta bottle it, son. Yes sir, we oughta bottle it and sell it in the general store! You got troubles? Will take a good deep drink of Lucas McCain! You’re bound to be cured!” He was sputtering this at me. This really hurt me. He had no idea how much. I tried to keep a straight face, to keep the hurt look from showing, but I didn’t quite succeed. “Well, go ahead and take it!” Micah yelled as he shoved the badge into my face. I only stared at him. “Take it!” he yelled again. “I don’t want it!” Then he threw it across the room, went to the back of the office, and slammed the door, leaving me to stare after him. If Micah wasn’t going to do his job, I knew I would have to step in for him. So reluctantly, I went over and picked the badge up. Then I put it in my pocket and walked out the door. I looked across the street to the Saloon, knowing the People’s Committee was in there drinking. I knew I didn’t need a lot of drunk Vigilantes to deal with as well, so I started across the street to get rid of at least one of my problems. Mr. Hannabury saw me grab my rifle and called after me. He was armed with his shotgun. "Are you going to talk to them vigilante fellows all alone?" He asked. I didn’t feel like dealing with him on top of everything else, so I calmly said, “Oh, I think I can handle them alone, Mr. Hannabury.” I assured him. Then I started across the street. But that answer didn’t satisfy Mr. Hannabury. Why should it? Nothing else I said seemed to satisfy anybody – at least not today! “No! That’s what my cousin Jeb said before they shot him. No! No, Mr. McCain. When the chips are down, you can bank on old man Hannabury, and that's a fact! Moral support Mr. McCain, right to the grave." Right to the grave? And he was coming in to help me? I stopped and stared at him for a moment. Then I slowly walked into the saloon to talk to Mr. Jethroe, who was having a drink just as I suspected. I then pulled the Marshall’s badge from my pocket and showed it to him. I could tell by the look on his face that he got my point. "You have a way of acquiring responsibility Mr. McCain," he stated. He tried to convince me that they had an obligation to take Mr. Stoddard with them. I don’t know who he was fooling, but it wasn’t me! “Your law and our law are two different things,” I answered. “What’s your stake in this, Mr. McCain?” Jethroe asked. I answered his question with a question. "What's yours?" "Simple justice," he answered. He didn't want to see a guilty man go unpunished. I turned to watch the two men at the table. Their hands were getting awful busy. “I’m not talking about innocence or guilt,” I stated. He asked me what I was talking about. “Your method of simple justice,” I answered bitterly. He started to tell me he was a idealist. But I suddenly saw the men reaching for their guns. I immediately pointed my rifle at them and shot. I shot at his glass shattering it Then the other man picked up a bottle to throw it at me, so I shot it out of his hand. I pointed my rifle at him. “Make a threat, Mr. Jethroe. I’m listening,” I dared him. I stopped him right there. “Don’t come back in a week, Mr. Jethroe. Don’t you ever come back!” I ordered. “Now, when Stoddard can travel, we'll bring him to you...or his body,” I assu red him once again. "Well I consider that a statement of honor. 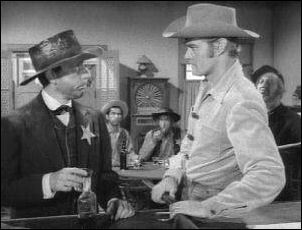 We'll be expecting you," said Jethroe as he and the other two vigilantes walked out the saloon. "I got so made at them buzzards in there I could have killed one of them cold turkey for sure...if it was loaded," he stated. “Yeah, of course” was all I could say. I couldn't believe what I was hearing! This man was crazy! As I walked away I could hear Mr. Hannabury say "Moral support Mr. McCain." I only turned and stared at him. “Yeah?” I waited, but he never said anything. I walked over to his desk and laid his badge down. “I’m putting your badge on the table, Micah. You think your hand will be steady enough to pin it back on?” I saw the whisky bottle on the desk. It was empty. The law man had drank a whole body of whisky. I couldn’t believe this man. I picked up the whisky bottle. "Maybe I ought to buy you another bottle first." I angrily threw it against the wall above where he sat, shattering it into pieces. I’d had enough of him! I walked over to the door, deciding to leave him to his misery. But he suddenly stopped me. He turned in his chair and called out to me. I could see defeat in his eyes. I knew he was ready to talk. Here was his surprising story. Thirty years ago John Stoddard was my closest friend. Stood up for me at my wedding. I married Elizabeth Cook, the prettiest girl in Montana Territory and I guess I was just about the happiest man anywhere. Elizabeth was 18 and I was 22 and nothing was impossible for us. You know the feeling Lucas?" All too well did I know this feeling he was talking about. As Micah talked I couldn't help but reflect back on my times with Margaret. It sounded like Micah and Elizabeth had what Margaret and I had. This part of Micah, I had never seen before nor had he told me about this. I knew what he meant. I had felt the same way with my wife. And I still feel that same way with my son. “Well, in August I went into a panic and borrowed $200. Mortgaged everything I owned: the farm, equipment, everything…When I got back that night, the three of us were sitting around the kitchen table trying to figure out how we were going to make it through the winter without loosing the farm. We made a budget, Lucas. Accounted for every penny and then some. This was a very sad story, but talking about it had seemed to remove all his anger, leaving in it’s place regret and sadness of the memories. I asked Micah what he did. “Do? Elizabeth died in September. She got the fever. I was forced to sell our horse the month before and had to run all the way to town to get a doctor. When I got back she was dead. And thanks to Stoddard, she died all alone on a dirt farm that wasn't even mine anymore.” A little anger had returned to his voice. I didn’t blame him. He had a right to be angry. Just then, the door opened. Mark rushed in to tell Micah that Doc wanted him to come on over. I told Mark we’d be there in a minute. Mark never argued with me unless it was important. So when he told me Micah had to come right away, I knew it was serious. I turned and looked at Micah to see what he would do. Much to my pleasure, he hurried out the door. As Micah approached, Stoddard held up an envelope for Micah to take. Stoddard was clinging to life for this moment. The man was gasping for breath. He had to work hard to get the last words out. "Here Micah.....take it.....I've been looking for you. To tell you how sorry I am." Then, he breathed in one last breath. With it, his last words were “Please forgive me!” With that, he breathed out that breath and died. Micah looked inside the envelope. I asked him what it was. “$400,” he answered sadly. Then he walked out the door. Well, that was it! It was all over. What a day. Oh, except one more thing. You know that boy of mine? The one who had a million questions? He was so sad about this stranger. "Why did he have to die?" He asked. I put my arm around him to comfort him. I didn’t have any easy words for him. I simply had to lay the truth out in front of him, knowing he would have to grasp it. "The earth turns Mark. His time was up. I don't know what kind of a man Stoddard was. I'm not sure we'll ever know. But he kept a promise he made thirty years ago. I think that's what we should remember him by, and so does Micah." I know Mark didn’t understand a lot of what happened that day, but I do think he understood what I told him. Well, that’s that. I thought it was time to go home! We left the office, the stranger that had briefly entered our lives laid dead as our lives went on. 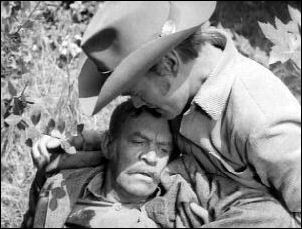 piddlin' stuff.....Chuck Connors had a hand in writing this episode ~ he came up with the story idea for Blood Brother. 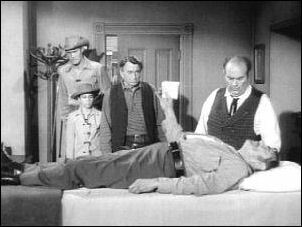 Richard Devon has appeared in seven episodes ― The Spiked Rifle as Austin Stark, the leader of the gang and the man who fooled Lucas into thinking Mark was kidnapped ― Blood Brother as Jethroe, the man in charge of the People's Committee who was looking for John Stoddard ― The Grasshopper as Walt Ryerson, the man in the handcuffs who Lucas applied a tourniquet to ― The Silent Knife as Ben Macowan, he was the guy who picked on big Mark ― Miss Milly as Jack Adams, he was the man Milly hired to be her bill collector ― The Most Amazing Man as Lovett, he was the gunslinger who forced Wade Randall into a gun fight. He was so brave until he saw what a good a shot Wade was (with Lucas' help) ― The Stand-In as Gus Potter, the prison guard that passed out when the two guards were drinkin'. Ian Murray played Harley Hannabury in seven episodes ― The Challenge ― Blood Brother ― Obituary ― Meeting at Midnight ― The Hangman ― The Illustrator ― The Fourflushers as one of the townsmen. Kelton Garwood appeared twice in two episodes ― Blood Brother as Smith, one of the men (vigilante) with the People's Committee, he was the one with the beard and mustache ― Sins of the Father as Tom Coleman, the brother of Shep Coleman, one of the vigilante brothers who came after Andy Moon for killing his brother. Larry Perron appeared in three episodes ― Blood Brother as Dan Cameron, he was one of the men with the People's Committee, (vigilante group) the with the light colored hat ― Baranca as Eddie, he was one of the card players in the saloon and Hadley's partner in crime and Sag in Death Trap as one of Spicer's gang. Rhys Williams appeared as Doc Burrage in six episodes ― Blood Brother ― Bloodlines ― Letter of the Law ― A Case of Identity ― Sins of the Father ― The Prodigal. Remember him in The Sharpshooter? Remember when Lucas shot the whiskey bottle and it shattered into pieces? Archie was the cowboy who slid the whiskey bottle to Lucas. Sometimes Archie was a stand-in for Paul Fix. 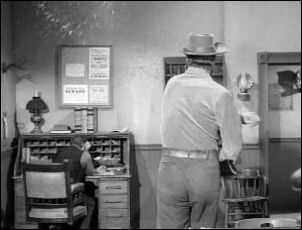 Fritz Ford appeared in twenty episodes and still counting. 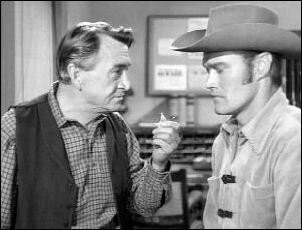 Besides acting in The Rifleman he was also a stunt double for Chuck Connors. Bobby Somers — has done many of stunts in his day. He worked with some of the best! Sadly Bobby went unaccredited in most of his movies/shows. His list of credits is way to far to list. Please checkout IMDB for a list of his credits. Although Bobby is known for his stunts, Bobby did a lot of different thing such as Miscellaneous Crew and Acting.